Be the first to share your favorite memory, photo or story of Henny. This memorial page is dedicated for family, friends and future generations to celebrate the life of their loved one. 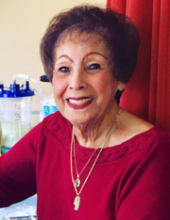 Henny Ring Crane, 87, of Fairfield, California passed away peacefully on April 8, 2019. Henny was born on Feb. 16, 1932 at Ft. Stotsenburg Army Base in Angeles City, Philippines to Walter and Cipriana Ring. Henny worked from 1981-2004 for Travis Air Force Base California Gateway Enlisted Club and Delta Breeze Officers Club as a dining room supervisor/caterer. Henny always loved cooking and feeding other people, especially her family. She was a beloved wife, mother of five, grandmother of 10 and great-grandmother of 23. She will always be remembered for her tireless work ethic and feisty spirit. She was married for 54 years to Jerome Crane who preceded her in death February 2019. She is survived by brothers, Henry Ring, Louis Ring, Marvin Ring; sister, Ruth Long; sons, John Buchanan and Chuck Tayag; daughters, Cleo Grimm and Rosa Obetz. She was also preceded in death by son, Randall Crane; brother, Samuel Ring; sister, Francis Tomlinson; and her parents. Please join us to celebrate her life from 11 a.m. to 1:30 p.m. Tuesday April 23, 2019, at McCune Garden Chapel, 212 Main St. Vacaville, California. Interment at Sacramento Valley National Cemetery, 5810 Midway Road Dixon, California.Officiated by her nephew, Reverend Richard Pacania, Chaplain (Major) United States Army (Retired). To send flowers or a remembrance gift to the family of Henny Ring Crane, please visit our Tribute Store. Guaranteed delivery before Henny's visitation begins. Guaranteed delivery before Henny's service begins. "Email Address" would like to share the life celebration of Henny Ring Crane. Click on the "link" to go to share a favorite memory or leave a condolence message for the family.